"Color My World" in Week Thirty Eight of my "Weekly Creative Challenge"
I love adding color to my designs. That is why I create colorful drawings to insert into my pendants, or add wonderful crystals, gemstones, pearls, and Czech glass to my designs. I'm now on the hunt to find and experiment with a new way to add color to the metal I use "itself". I use Liver of Sulfur to darken my metal work. I really like how it enhances the texture that I add to my metal work. Now I want to add "real colors". 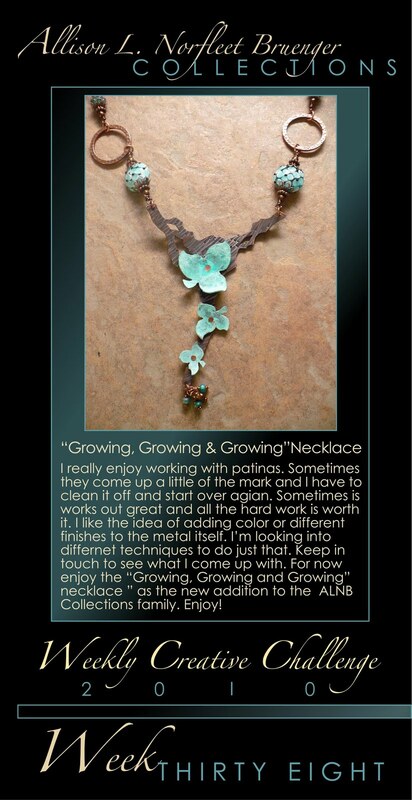 So I'm now working with patinas to add color to my work. This is one of my designs that I truly enjoyed working on. I love that I can add color to different components to my designs. It has been fun so far and I think this technique is a" keeper". Check in with my blog to see upcoming attempts to add just "a little something extra" to my work in the future. So enjoy the new addition "Growing , Growing and Growing". Thank you for checking in.